For many years we have utilized manual and other chiropractic techniques to improve function. Over the past 8 years we have consistently combined the newest proven adjustment techniques with an amazing system of analysis and treatment, allowing our patients to get back into alignment in less time, with less cost to them. We have used and continued to use the very latest technology to improve our patients health. When it comes to the spine and the nervous system, we analyze and treat in the most comfortable way. 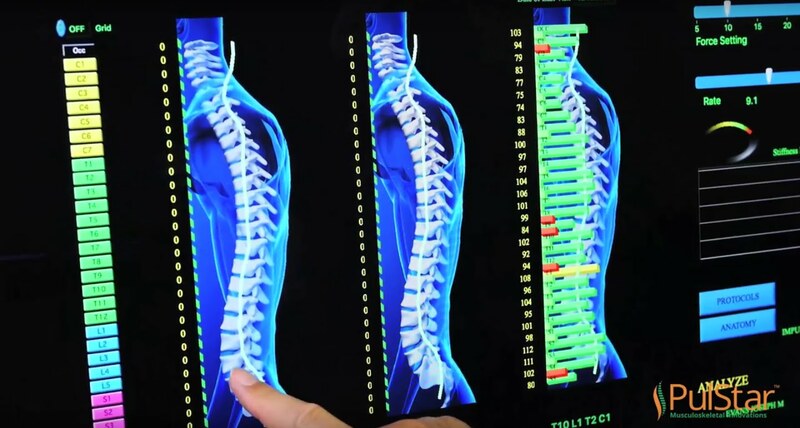 Computerized adjusting offers an advanced assessment of each vertebra before and after treatment. Our patients find this therapy convenient as well as highly effective in treating conditions such as lower back pain, neck pain, headaches, and whiplash. It is also useful for treating carpal tunnel syndrome, plantar fasciitis and other foot pain, and shoulder problems. The PulStar instrument is a computerized handheld device used for analyzing and adjusting a patient’s spinal fixations and misalignments. As the doctor guides the tool gently down the spine, it evaluates areas of the spine that are not moving correctly. This system provides a computerized visual report of the current status of spinal joints and their motion. After the evaluation is complete, the doctor uses the PulStar instrument to deliver precise and gentle computer controlled impulses to the areas in need of correction. As adjustments are being delivered, the PulStar instrument and the doctor are analyzing the changes to ensure maximum benefit was delivered. Many of our patients report that computerized adjustments create a sense of calm and well-being in addition to relieving pain. A sensation of light tapping on the part of the spine treated is common. It is through this gentle and scientific approach that patients experience consistent and powerful change in their condition and their health. Call our office today to find out more about PulStar adjusting!